From the scripture we know there is more than one gate. ('gates' plural). There are supposedly 12 gates into heaven the same as the number of apostles, the demon loves to mock God, so their must be more than one gate into hell, but how many? St. Alphonsus Liguori said there were four principal gates to hell: Hatred, Blasphemy, Theft and Impurity. I'm betting there are more than this, I think there are somewhere between 6 and 666 gates to hell. Either way, we know there are gates, and there is more than one. So how could 'gates' prevail against God's church? There are two ways a gate can 'prevail'. 1). A gate could prevail if the gate would hold fast when it is being assaulted by an enemy force. We could not breach the gate. 2). A gate would prevail, if it were opened and there was such a sizable force was on the other side of that gate that would defeat whatever was attacking the gates. So lets look at what is on the other side of that gate. The devil and his demons are there, the fallen angels. Also the condemned souls are there also. Granted, the demons are smarter than us, and they know the law of God and the bible, better than any of us can know it. Also, the demons hate us, because we are made in the image of God and they would do anything, risk any future torture in hell to have us under their power in hell so they could inflict suffering on God's creation. God made hell for the devil and his fallen angels, not for man. All things are under God's power, and the only thing he will not supersede is our free will. We can choose this kingdom of darkness and suffering for all eternity if we wish, just by choosing to do so by rejecting God by our sins. So who let the demons out of hell? We did. Whenever a condemned soul passes into hell, or a mortal sin is committed by man, more demons have a chance to escape and tempt the weak into mortal sin. By the many sins in the world we have opened the gates of destruction and death that the evil one wishes to give to each one of us. The good news is that although we do not have the power to close the gates, through God's church and the sacraments and sacramentals, we can definitely ask God to close them! 1. See this previous blogpost: Battling the Demon. 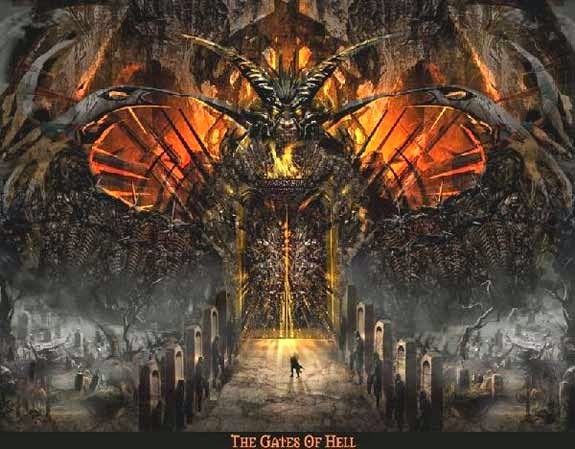 Storm the Gates: Part 2: My Experience With Storming The Gates of Hell.